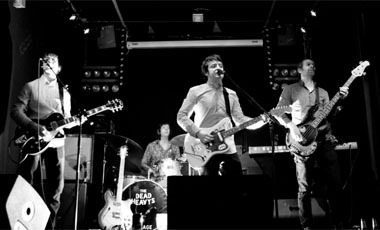 The Dead Heavys, – an understated piece of genius of a band.These guys are full of funk and indie rock vibes, with an infectious splash of the psychedelic and a top notch set of killer lyrics. It’s no surprise that we had to have these guys play a gig for us. Having performed at Electric Picnic, Indiependence, and Croatia’s IN Music festival alongside the Arctic Monkeys and Basement Jaxx (to name but a few), this band was chosen from 800 Guinness Amplify acts by deputy editor at HotPress, Mr Stuart Clark.It has to be said that this band has depth and plays with much style and honesty. Their live shows draw the crowds away from the bars, bringing them into their show,and their warm upbeat funk and indie rock is handed to the listener on a platter. Their delicious sound with brass section is a real palate cleanser, setting this band aside from others as a real thinking music lover’s bit of crumpet. Doing great work at the moment with Jagz Kooner, (who has worked with Primal Scream, the Manic Street Preachers, Oasis, Kasabian, andThe Charlatans to name but a few), this 5 piece Waterford band has new material about to drop and a set of gig details about to announce very soon. We’re certain that if you have not heard these guys live before Apr 21st, that our gig will whet your appetite for more! Support Act coming from the equally talented Manchester band, The Mantells. You only have to hear their latest EP “Can’t Stop Won’t Stop” to know why we had to have them play for us. BBC Introducing Manchester are big fans, – and it has to be said their live action really is a bit special, having recently played to a packed out Manchester Ritz. With catchy tracks like “Payday Playboys” and “Men In Suits” we know these lads will not only put a smile on your face but a groove in your step too (unless of course there’s something wrong with you).